Oregon's Measure 91 picks up a nice endorsement, a marijuana legalization vote in York, Maine, is snuffed out, decrim advances in the US Virgin Islands, Rand Paul tells the GOP to reach out on drug policy, Joe McNamara passes, the OAS passes a drug policy resolution, and more. Oregon Legalization Initiative Endorsed By Former US Attorney . Former Oregon US Attorney Kris Olson today endorsed Measure 91 , the Oregon marijuana legalization initiative. "I enforced our marijuana laws, and they don't work," she said. "Filling our courts and jails has failed to reduce marijuana use, and drug cartels are pocketing all the profits." Olson was US Attorney for Oregon from 1994 to 2001. Meanwhile, the Oregon State Sheriff's Association has made a $100,000 donation  to the No on 91 campaign. York, Maine, Effort to Get Marijuana Vote on Ballot Thwarted . A state court judge last Friday rejected an effort to put a local marijuana possession legalization on the ballot in York. York County Superior Court Judge Paul Fritzsche sided with town councilmen, who had rejected two citizen petitions seeking the vote. Fritzsche ruled that York cannot regulate marijuana because it is governed by state and federal law. Two other Maine towns, Lewiston and South Portland, will vote in November. The state's largest city, Portland, approved a similar initiative last year. US Virgin Islands Decriminalization Bill Wins Committee Vote . A bill that would decriminalize possession of small amounts of marijuana was approved by the Virgin Islands Senate Committee on Homeland Security, Public Safety, and Justice last Thursday. The measure is Bill 30-0018 . It would make possession of an ounce or less of weed a civil offense punishable by a fine of between $100 and $200, with the possible forfeiture of the contraband. Today is Deadline Day for Illinois Medical Marijuana Business Applicants . People who want to operate medical marijuana businesses have until 3 pm CDT to hand in their applications to state agencies. The Illinois Medical Marijuana Pilot Program  has more information. Rand Paul Calls on Republicans to Embrace Drug Reform, Other Non-Traditional GOP Planks . Sen. Rand Paul (R-KY) used a speech Saturday to the California GOP convention to call on the party to reach beyond its base by embracing issues such as drug reform, privacy in personal communications, voting rights, and an anti-interventionist foreign policy. Republicans need to "show compassion for people," especially young black and brown people disproportionately affected by the war on drugs. "If you look at surveys, it's not that they're using drugs more than your kids are using drugs, it's because they're getting caught because they live in an urban environment with more patrols, they have less good attorneys, they don't have the resources, and some of the laws are still frankly wrong," he said. Pentagon Surplus Arms Program Let Military Weapons Go to Police Forces That Abused Civil Rights . The Pentagon's program to distribute surplus military equipment to US civilian police forces allows even agencies that have been censured by the Justice Department for civil rights violations to receive lethal weaponry. The Defense and Justice Departments have apparently not been coordinating on the program, the Associated Press reports. Drug Reforming Police Chief Joe McNamara Dies at 79 . One of the earliest law enforcement voices for drug reform is no longer with us. Former San Jose Police Chief Joseph McNamara died last Friday at his home in Monterey, California. 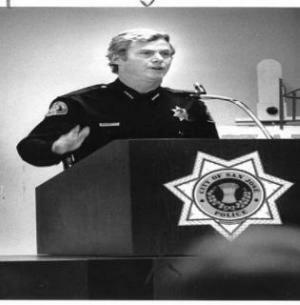 He is credited with bringing progressive reforms to the San Jose Police Department in the 1970s. After retiring as police chief in 1992, he went to work at the Hoover Institution, where he continued and sharpened his criticism of the war on drugs. "He was the police chief who became the most deeply involved in the drug policy reform movement," said Ethan Nadelmann, founder and executive director of the Drug Policy Alliance , who had worked with McNamara on issues for the past 25 years. "He was convinced the drug war was a total disaster and he needed to speak out about that." OAS Issues Resolution on Drug Policy . At its 46th Special Session in Guatemala City last Friday, the Organization of American States passed a resolution calling for states to "regularly review the drug policies adopted, ensure that they are comprehensive and focused on the well-being of the individual, in order to address their national challenges and assess their impact and effectiveness." The resolution also called on states to develop drug policies "that prevent social costs or contribute to their reduction; and, when appropriate, reviewing traditional approaches and considering the development of new approaches, based on scientific evidence and knowledge." And it calls for states to develop comprehensive approaches that examine "the structural causes, triggers, and the multiple factors that contribute to violence and crime" with a view to taking them into account when drafting the 2016-2020 Hemispheric Plan of Action on Drugs. Click on the link to read the OAS press release.